I think there is nothing better that a good short sharp piece of practical advice that accurately encapsulates an entire idea or concept into just a few words. I don’t think I am alone in this as Twitter currently has over 500 million users with over 300 active each month, although I am not sure that all tweets meet the “practical advice” requirement! That is a lot of people. Australia has a population of 23 million people. 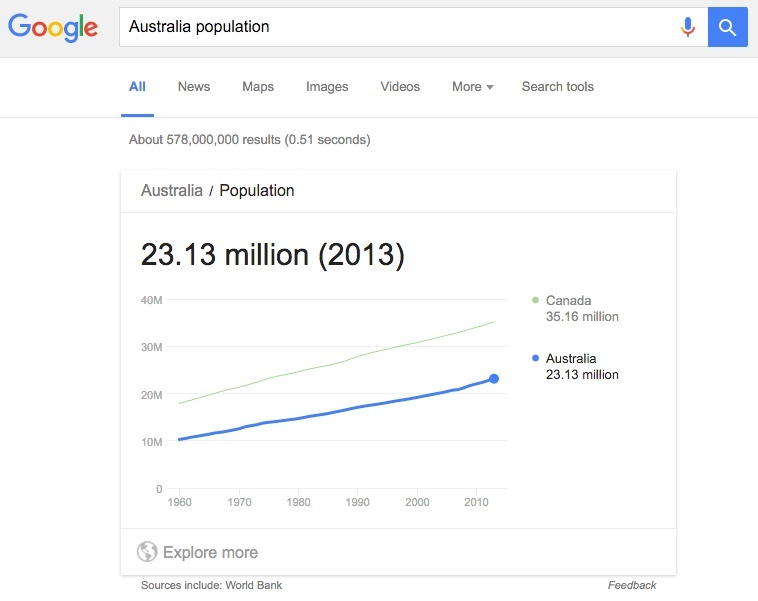 In fact, it is so few that when I searched for “Australia population” to check we had crossed the 23 million mark, Google felt sorry for me and decided to add Canada along side to boost our numbers. Lucky they didn’t add the US, China or India to the graph or you wouldn’t be able to see the Australian line down the bottom. Interestingly when I search for “Canada population” they included the population of California, which just so happens to be both growing faster than and be larger than Australia. Anyway, I have been posting my thoughts on money to Twitter (using the hash tag #MoneyTips) and found that some of them were very hard to keep within that magic but annoying 140 character limit. So far I have managed it, however sometimes a little of the meaning seems to get lost and occasionally I wanted to add a little more explanation. Enter this page – a place where I will keep my money tips and expand on them with some additional information and thought. Not all of these will apply to everyone of course. But they are tips that I use from time to time in my own life. As I have mentioned before, I am always open to changing my position on things as my understanding grows – so hit me up if you have a different position on some of them. Also tweet @RememberToWater if you have any of your own tips you want to share. So these are the first ten tips explained. I attempted to start out simple and so the first ten are just a few simple ideas that came to mind first. There is no real order to them; which is strange as there is normally order in most things I do. Ah well, you can’t win them all! These (along with all future ones) are all listed on the Money Tips Explained page if you are after more. Build up 2 or more months of living expenses in an emergency account. An emergency account will allow you to pay unexpected bills without going into debt. It will also greatly reduce your worry around whether you will have enough money to pay a bill. Just remember to top back up the account if you use it. Ask the bank for a better home loan rate – take examples, even banks price match. Almost all banks will come to the party on interest rates. Shop around and find the best rate. Then shop around to find the best few banks (branch locations, loan features etc) and see which will come closest to matching the best rate you found. Most banks managed to get within about 0.1% of the lowest rate we found for a comparable loan. Consider selling your items rather than throwing them out – some of it will sell. $10 here and $20 there can quickly add up. There is nothing better than having an extra few bucks at the end of the month for items that you were getting rid of anyway. If you know what they are worth list them on sites like Gumtree (no fees), if you don’t and haven’t got time to research go for an auction site like eBay. Rent a less expensive place while you are looking to buy. Paying less rent means saving more deposit. Saving a larger deposit can help to get rid of lenders mortgage insurance. Calculate your Repayment To Rent Ratio and see where you land. Bring a reusable water bottle. You will snack less and pay less for drinks out. Drinking more water is not only healthy, but can help minimise snacking. It also means that if you need to buy lunch out you don’t have to get the overpriced drunk with your meal. Never shop on an empty stomach – everything will look so tasty. I am guilty here. I want just about every food item I see when hungry. If you don’t have a list, or can’t stick to one then make sure you have eaten before shopping. That way you won’t be tempted by those salt and vinegar chips and sweet chilli cashews when you see them. Buy a deep freezer and buy cheaper in bulk – some math may be required. Buying in bulk can save you money. The problem is that you need a way to store that bulk. A chest freezer will allow you to buy larger amounts of perishable items and freeze them. Move your emergency money to a high interest online savings account. One problem with having an emergency account is that the money is just sitting there not earning much interest. Why not move it into a high interest online savings account. You can still get at the money almost instantly – just make sure you have a transaction account with the same bank. Take public transport. Compare extra time costs vs parking & petrol costs. Only once in my life has it been cheaper to drive rather than catch the bus. Even then it was close and required free parking. You should consider how much the convenience/time savings from driving a car to work is worth to you. Then compare that amount with the savings you would get from taking public transport. Bring your own snacks on budget airplane flights. The price for snacks can be more than double on inflight menus. Bring some snacks with you and enjoy the instant 50% saving you get. Not to mention the expanded choice from a full-sized supermarket. Point 2 and 8 are by far some of the most impacting things we did. They require some work up front. Once in place, the results are amazing. Totally! The interest rate we managed to get was fantastic at the time. It got a little worse as the rates dropped but still within 0.1% of the best I could find. We did some calcs around how much we would save per 0.1% over the years we expected to have left on our loan and found that it wasn’t worth it for that 0.1% at the time we looked. I Wonder also if we need to refinance again…! Hey Tom, lots of nice tips there. We’ve got the emergency fund sorted. We don’t have a loan so that can’t help us yet. We’ll shop around when we do get one. We’re renting as cheaply as we can in a place that’s about an commute each way for me to get to work. We’re sometimes guilty of shopping on an empty stomach, but we’re dedicated list makers and only buy what’s on the list. I take public transport to get to work. We only have 1 car, it works for us. It’s definitely cheaper to buy food from a supermarket, or even in the airport, rather than on the plane. I enjoyed reading this, can’t wait for the next 10. Glad you enjoyed it – the freezer one can be a tough balancing act. Two things kick started it for me. Firstly our neighbours gave us a deep freeze which saved a lot of money. Secondly we ate a log of chicken at the time, and found it cost around $10/kg at normal supermarket prices, but was $6/kg at a butcher in bulk (10kg+). When we found ourselves buying around 4 to 5kg the extra $10 to double the quantity was an easy sell. But you do have to look at up front cost and electricity. Interesting – are you buying whole chickens or chicken meat? We consider whole chickens over shredded chicken or chicken breast/thigh meat but then you’re buying so much bone weight. if it’s just the meat, no bone, that may be worth it for us to look at (from a butcher) even if we don’t have freezer. Chicken breast (sometimes thigh, but normally breast). We would often use them for things like BBQ’s with friends & make our own kebabs rather than buy them for $1.50 each (and get worse chicken)! We also now do it for things like roast’s, buy a few when they are on special and freeze for a few months. Good to have you back here Tom! For me 3 months in an emergency account is important, rather than 2, although it really depends on how disciplined you are with money & it’s really a subjective # based on perspective..
Love these tips though & I sense that this could be an E-Book down the track :)! Yeah, 2 may be a little low for some people. We try and keep a minimum of 2 “normal” months because there are a number of things we can easily stop if things get tight (e.g. 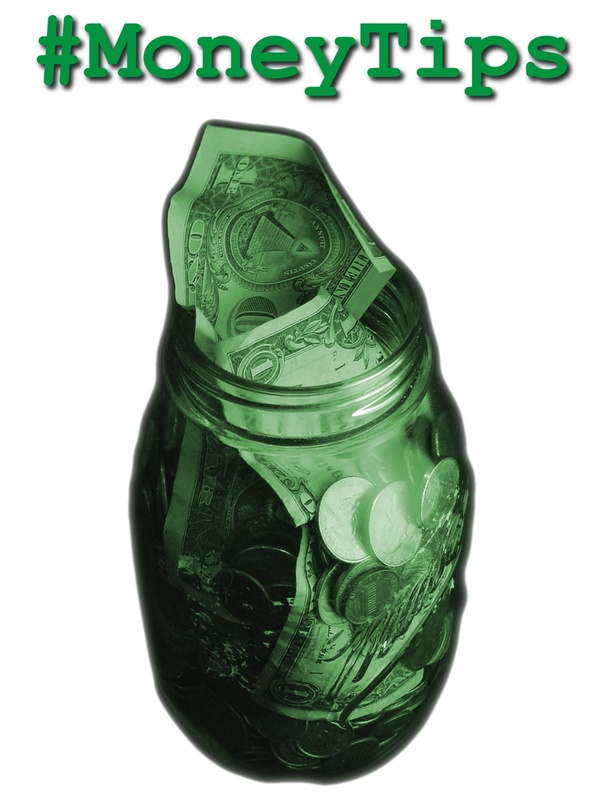 cutting our giving/donations would extend our 2 months to 3 months). In reality we currently have around 24 months but are actively moving that into either shares or holding it for our investment property deposit. Book… possibly. Although they will all be available free online so not sure people would pay for it. But it is an interesting idea, I think I would have to polish up some of the explanations. Agreed on the 2 months being too low although as you say it can be adjusted.. Keep posting & I’ll keep reading! #5 is a good one! So many people waste money by constantly buying bottled water when they could just use a $10 reuseable that is better for the environment as well! Totally! I hate to think how much people spend on bottled water each year. The only times I have been on the bottled water train was when in places where the water was not safe to drink. An expense that I think was very much worth it (after hearing other people – thin walls in the bathroom). A great alternative to #8 is an offset account if you have a mortgage. I like seeing how much interest I am saving each month & try to increase it . Indeed – an offset account is a fantastic place to park money if you have a mortgage. It will defiantly save you more than a high interest savings account. I never actually had one as I just put the money straight into the loan, and had a loan with unlimited instant redraws. It looked just like another bank account (just with a negative sign). Great tips! We always bring our own food on road trips and flights. Cheaper and always, always healthier! Oh… unfortunately I defiantly cant agree with that one! Always cheaper, but (at least in my case) not always healthier :(. Although that is why one of my new year goals for 2017 is to lose some weight. I like the take public transport tip. I took that a step further and sold the car. I didn’t really need it in Sydney. The battery went flat from lack of use and that seemed a sign I didn’t actually need it. Good job! I have some friends who are carless, however we live too far out of the city for it to work for us (given the level of convenience I want and am willing to pay for). However we did move from 2 cars down to 1 car, or 50% of a car each?